Bioenergy coppice willow growing at the Sussex site. Research from the University of Southampton has played a major role in a new report that highlights the importance of bioenergy in moving the UK towards a low carbon economy. The report, by the Government and industry and sponsored by the Energy Technology Institute (ETI), features the research of Professor Gail Taylor that highlights how bioenergy can deliver significant greenhouse gas savings, provided that the right crop is planted on appropriate land. “Planting 30,000 hectares a year of second generation, non-food bioenergy crops would keep the UK on a trajectory for scaling domestic biomass to 2050, making bioenergy a significant contributor to a future low carbon economy,” said Geraldine Newton-Cross, ETI Strategy Manager and author of the report. The report summarises much of the research from a four-year, £4 million project funded by ETI. The project included several sites where data was collected to assess the changes in soil carbon and greenhouse gas emissions from bioenergy crops, including short rotation coppice willow. This was linked to state-of-the-art spatial modelling for the UK and a systematic review of the literature. The Southampton team, including Dr Robert Holland, Dr Zoe Harris, Dr Maud Viger, Dr Suzie Milner, Dr Matthew Tallis and PhD student, Joe Jenkins, developed a unique site in Sussex that followed a land use transition from grassland to short rotation coppice willow, as a bioenergy crop. 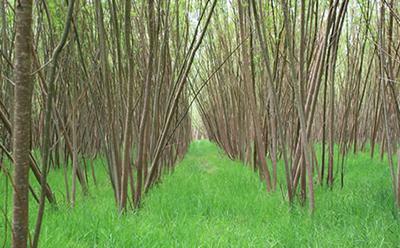 Their research revealed greenhouse gas savings when the land transitioned from grass to bioenergy willow. 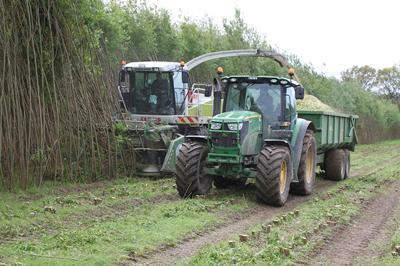 Harvesting of bioenergy coppice from the research site in Sussex. “This research has provided important measurement- based evidence to show how growing bioenergy crops can deliver carbon emissions reductions for the UK whilst at the same time, reducing our carbon dioxide emissions,” said Professor Taylor. Overall the ETI report will inform policy decisions and shows that bioenergy is a flexible low carbon option for the UK that if deployed to meet 10 per cent of future energy demand, could deliver a 55 million tonnes per year of CO2 emissions cut to 2050.